The reggae group, which includes Ali's brothers Robin and Duncan, have accused him of "hoodwinking" fans by using the same name, reported the Daily Mirror. The band, which also includes Jimmy Brown, Norman Hassan, Brian Travers and Earl Falconer, claim the rival trio have no right to the title, and have served writs on Ali and pianist Mickey Virtue, who both left the band in 2008, as well as singer Terence 'Astro' Wilson, who left in November. They now perform as UB40 Reunited. Guitarist and vocalist Robin Campbell said: "Ali is selling tickets as UB40 when he isn't. He's taken our name because he can't sell tickets on his own. "They are perfectly entitled to play any UB40 tracks they like. What they are not entitled to do is to pretend they are UB40. Fans are being hoodwinked." 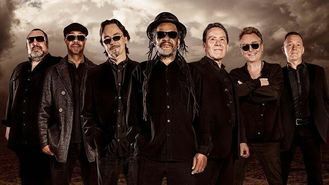 Ali, Mickey and Terence started calling themselves UB40 in February, and have toured around the world using that name. Robin continued: "Earlier this year Ali appeared on Australian TV, claiming to have re-formed and reunited UB40. It's not true. The band never split up and never parted. We just carried on doing what we had always been doing after he left. We will give evidence against Ali if necessary. "I don't feel anything for my brother any more after the vitriol he has heaped on me over the last six years," he added. Duncan said: "It really hurts. We were incredibly close. I can't believe it's come to this. "He's the one doing covers of old UB40 songs and become a tribute band. We like tribute bands because they are out there every night promoting our music - but they are not pretending to be the real UB40."